Residential housing design continues to move towards the development of high performance sustainable building systems. To be sustainable, a building must not only be efficient and durable but also economically viable. From this, new methods of enclosure design have been examined that provide high thermal performance and long-term durability but also take opportunities to reduce material use (including waste), simplify or integrate systems and details, and potentially reduce overall initial costs of construction. One concept relating to enclosure design is to incorporate the use exterior foam insulating sheathing into the construction of the wall assembly. As with any building enclosure system, appropriate detailing for the management of water, vapor, and energy transfer are necessary. As the desire to provide more thermally efficient enclosure assemblies increased so did the problems with moisture accumulation within building enclosure assemblies. Often the problems occurred due to new materials being introduced into the designs for specific purposes, without adequate understanding of all of their properties and the potential impacts on the assembly as a whole. Many enclosure failures occurred due to the lack of appreciation that products and materials have other properties than the ones that they are initially designed for. Though these lessons were hard learned, we can now use this knowledge for our benefit. Through examining and understanding materials based on all of their properties (not just what they were initially created for), we can eliminate redundancies in enclosure design, making the systems simpler and more cost effective. In cold climates the use of exterior rigid insulation sheathing boards has been a method of increasing thermal performance of the enclosure, as well as a means of reducing the condensation potential within exterior wall assemblies. This concept, while not new, has become more accepted in recent years and is being used in residential construction. While this method has proven to be effective, it was introduced as an addition to standard residential construction for a specific purpose. The base wall assembly generally remained unchanged, with other materials used for air sealing and water management. The opportunity that presented itself was the integration of the exterior rigid insulation board into the enclosure assembly to act not only as insulation but also as the primary sheathing and, in certain areas, as the drainage plane and vapor control layer for the wall assembly. This system combined with advanced framing concepts can provide cost savings from the reduction of building materials used (fewer studs, the elimination of plywood or OSB sheathing, and housewraps), and the reduction of construction waste (incorporating standard construction product dimensions in the design of the building to minimize cutting). While the use of exterior insulation was initially used in cold climates, the benefits of the integrated system from increased thermal performance and reduced costs make it viable in other climates zones as well. Still, proper understanding of the type of enclosure assemblies suitable for the overall climate zone in which the house is being constructed is critical. The choice of materials used will vary from climate zone to climate zone and the details for the water resistant barrier become more critical in areas of increased rainfall. 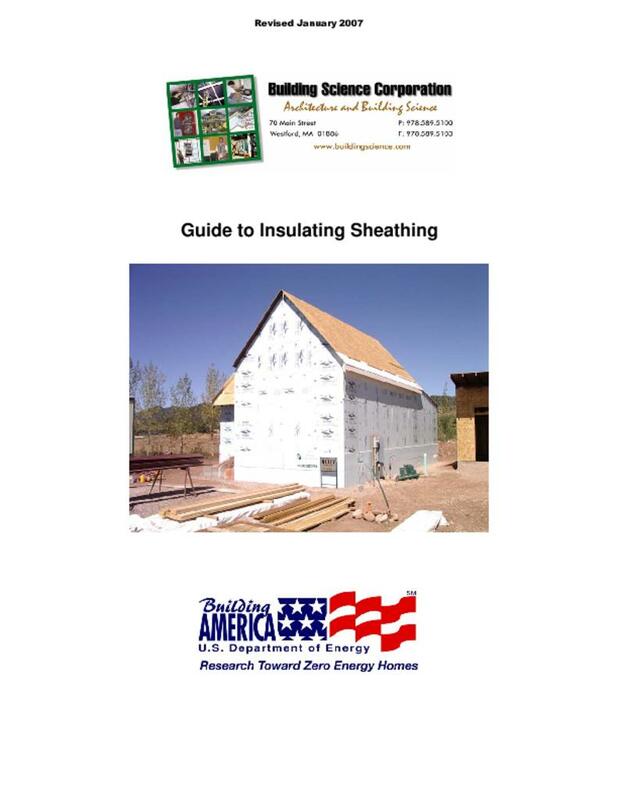 This guide examines the application of insulating sheathing to exterior wall assemblies, from the technical conceptual design and benefits to the installation and interaction with other building systems. There are three main types of insulating sheathing currently being used in the industry: Expanded Polystyrene (EPS), Extruded Polystyrene (XPS), and Polyisocyanurate (Polyiso). Each of these products all has a different set of physical properties that will affect the dynamic of the wall assemblies in regards to the transmission and management of heat and moisture. Insulating foam sheathings are split into two basic categories: 1) thermoplastics, 2) thermosets. Both EPS and XPS foams are thermoplastic foams, while Polyisocyanurate is a thermoset foam. Thermoplastics are based on linear or slightly branched (non-cross linked) polymers. These foams have a definite melting range and will soften and melt at elevated temperatures. They are also more prone to react and degrade when in contact with some organic solvents as found in some paints, adhesives, and fuels. Therefore it is important to only use manufacturer approved compatible materials when using thermoplastic foams. Of the thermoplastic foams, EPS and XPS are the most common used in the industry. Both products are based on polystyrene resin and are considered to be closed cell1 rigid foams. The manufacturing of EPS involves the expanding of polystyrene beads to fill a mold. The densities of EPS foam can be varied if desired. Increased density results in increased thermal resistance and compressive strength. The density of the product also affects the vapor transmission. While EPS is a closed cell foam (slow water vapor and air transmission through the cell walls), the gaps between the cells will still allow for moisture to pass through the matrix. With increased density, these spaces are reduced and the ability of the foam to allow water transmission is reduced. XPS foams are formed by mixing molten polystyrene with a blowing agent at the correct time, at an elevated temperature, and at an elevated pressure and then extruding the foam through a die to the atmosphere. This creates a more regular cell structure providing for better strength properties and higher water resistance that EPS foams. The density of XPS foams can also be varied, allowing for increased compressive strength, however due to the more regular cell structure, this has little to no effect on the vapor transmission properties. Thermoset plastics are based on cross linked polymers. This will allow thermoset plastics to be used for higher temperature applications as they do not usually exhibit a melting range and will instead char and burn. Thermoset foams are also generally more resistant to solvents and chemicals. The most common thermoset foam on the market is polyisocyanurate. While traditional polyurethane foams were created by reacting isocyanate with polyol (and other blowing agents, catalysts, and surfactants) polyisocyanurate foams can theoretically be created with no polyol, using only isocyanate reacting with itself (and other blowing agents, catalysts, and surfactants). In general though, commercial polyisocyanurate foam used in the market is really polyurethane foam modified with polyisocyanurate or a “blend” of the two foams. The use of the blend increases the fire resistance while maintaining the thermal resistance and strength of the material. The thermal resistance of each of the products will vary. In general, EPS foam has the lowest R-value per inch, with XPS being slightly more efficient, and with Polyisocyanurate having the best R-value per inch. The R-value of EPS foams can be increased by increasing the density of the product, however, the more dense expanded foams are less common in the market. Typically EPS foam has a rated value of approximately R-4 per inch. XPS foams are pretty consistent with an R-value of approximately R-5 per inch. While the thermal resistance of these thermoplastic foams is generally stable over the long term and therefore the initial R-value at the time of manufacturing will not change over time, polyisocyanurate foams are rated with a Long Term Thermal Resistance (LTTR) R-value representing a 15 year weighted R-value. This is in response to issues of thermal drift of the polyisocyanurate products. Thermal drift occurs due to the gasses produced during the forming of the foam. These gasses slowly diffuse out of the product over time and are replaced by air. Since these gasses also have more thermal resistance than air, the R-value of polyisocyanurate diminishes over time as the gasses diffuse out of the product. Facings on the insulation board, such as aluminum foil, will slow this process down as the diffusion can only occur out the edges of the product and not through the front and back faces. Most polyisocyanurate products have an LTTR R-value of R-6.5 per inch. manufacturers list the permeance of the material based on a thickness of 1 inch. Increasing or decreasing the thickness of the material will affect the permeance. This can become an issue when using XPS foam insulation. 1 inch of XPS has a permeance of 1.1 perms (borderline Class II and Class III vapor retarder), increasing the thickness to 2 inches decreases the permeance to 0.55 perms (middle of the Class II vapor retarder). Therefore, 1 inch of XPS is considered to be vapor semi-permeable, while 2 inches is considered to be vapor semi-impermeable. For faced rigid insulation boards (such as foil faced or glass fiber faced polyisocyanurate), the permeance of the facing is often much lower than the permeance of the polyisocyanurate and will govern the overall permeability of the sheathing board. For these products, the permeance will not change with increasing thickness. Insulating sheathings are generally fairly durable materials, however, they are not completely resistant to degradation. Polystyrene boards will degrade if left exposed to UV radiation for prolonged periods of time. The boards will discolor and a thin dusty film will form on the boards. Faced Polyisocyanurate is more resistant to UV degradation, however the unfaced polyisocyanurate boards are also susceptible to UV degradation. EPS boards are less durable for excessive handling. The edges of the boards can break off as the bond between the expanded beads is not as strong as the matrix formed with XPS and polyisocyanurate. This can leave the boards with more rounded edges and decrease the thermal value at the joints between the boards. Careful cutting and handling is recommended when using EPS boards. Most insulating sheathing boards are resistant to moisture, however problems with warping and cupping of the foil faced polyisocyanurate have occurred in the past when the boards have been left exposed to the weather for extended periods of time. As a general rule, it is considered good practice to store the boards in a protected, covered, and dry location on site and to limit the amount of time the boards are left exposed before being covered over by the cladding material. . .